Do you cut crown molding? Have you been looking for an integrated digital board measuring system that is easy to setup and use? 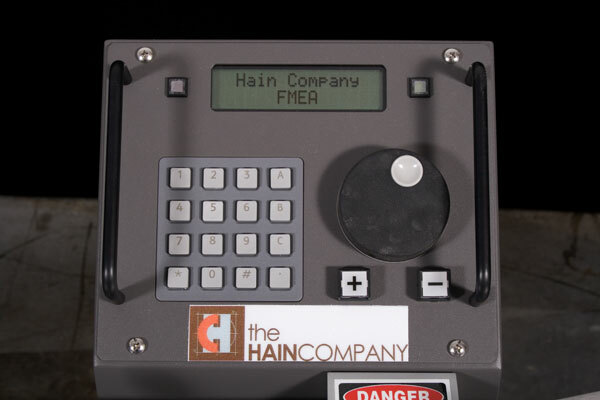 Then the Hain Company's Portable Measuring System (PMEA) is your answer. Once ready the PMEA changes from one selected board cut length to another in seconds all while maintaining accuracy. It is available in 6, 12, and 18 foot versions and can be easily configured to measure in Feet & Inches, Inches, Metric or Decimal. First time users are highly productive in minutes with very little training. The PMEA can utilize your existing chop-saw or any popular brand available on the market. 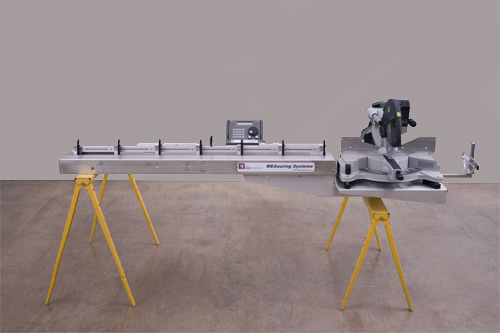 Within minutes you can create a precision random length cutting system that can instantly triple your production while enhancing the quality of the finish carpentry work you perform. The PMEA User Interface is very simple and easy to use with a large character digital Liquid Crystal Display (LCD), numeric keypad, rotary dial, function buttons and LED indicators. Computer skills are not required to operate the PMEA. The User Interface is located to the left of the chop-saw within easy reach of its operating position which eliminates unnecessary and time consuming operator movements. The operator simply enters the whole Inch value (or Feet-Inches or Centimeters) into the keypad, sets the sixteenth fractions using the rotary dial (or Millimeters), then if needed use the function buttons to add or subtract a 1/32 Inch. 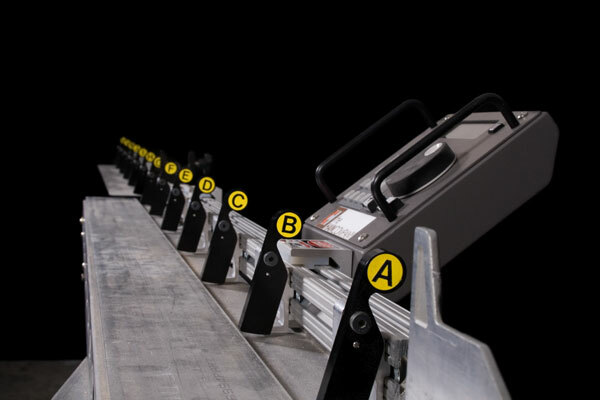 The PMEA automatically controls and advances the measuring stops to the length entered by the operator and the LED lights indicating the cut is ready to be made. The operator slides the material down to the stop listed on the User Interface LCD and makes the cut with the chop-saw. The entire process takes only seconds providing a highly productive labor saving integrated system. For non-portable applications the Hain Company offers the Table Mounted Measuring System (TMEA). The TMEA is a bench-mount version of the Portable Measuring System. It utilizes the same User interface and measuring stops as the PMEA and FMEA but does not include the portability, fold-up and chop-saw mounting features thereby providing an economical measuring system for fixed saw installations. The TMEA is mounted onto your existing bench-top utilizing mounting holes and or brackets provided with the system for simple and fast installations. The TMEA is also available in 6, 12, 18 foot version. Set-up for Use (maximum envelope): 15" wide x 11" tall x 139" long. Folded for transport (maximum envelope): 24" wide x 19" tall x 93" long. Set-up for Use (maximum envelope): 24" wide x 42" tall x 163" long.